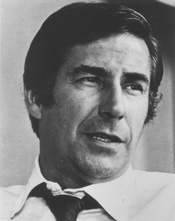 GRAVEL, Maurice Robert (Mike), a Senator from Alaska; born in Springfield, Hampden County, Mass., May 13, 1930; attended private schools; graduated, Columbia University 1956; member of the United States Army, Counter Intelligence Corps 1951-1954; member, Alaska house of representatives 1962-1966, elected speaker in 1965; author; engaged in real estate development in Anchorage and Kenai; elected as a Democrat to the United States Senate in 1968; reelected in 1974, and served from January 3, 1969, to January 3, 1981; unsuccessful candidate for renomination in 1980; is a resident of Arlington, Va.
Gravel, Mike, and Joe Lauria. A Political Odyssey: The Rise of American Militarism and One Mans Fight to Stop It. New York: Seven Stories Press, 2008; Gravel, Mike, Citizen Power: A Mandate for Change. Bloomington, Ind: AuthorHouse, 2008; Gravel, Mike. Citizen Power: A Peoples Platform. New York: Holt, Rinehart and Winston, 1972; Gravel, Mike. Jobs and More Jobs. Anchorage: Mt. McKinley Publishers, 1968.